Goood morning! 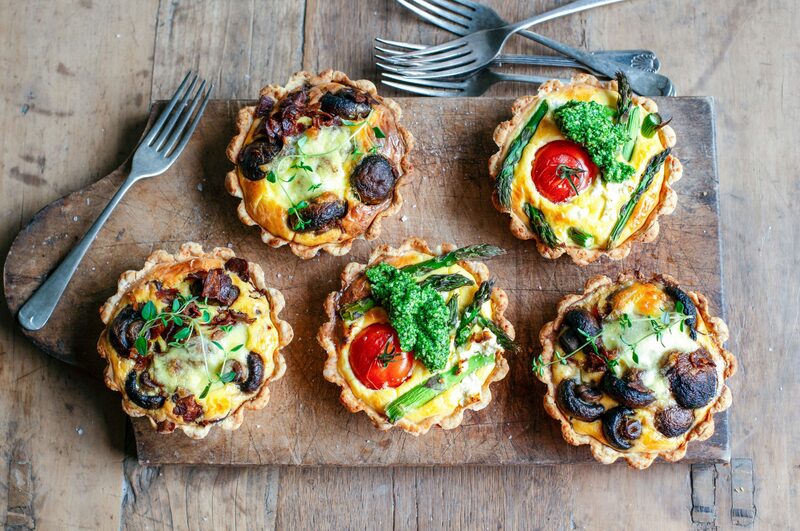 It feels like its been a while…today I have some delicious wee tarts for you that are ideally made to share with friends on a sunny Sunday afternoon with a glass or two of wine and a bitter green salad, but they also make a bloody fabulous picnic treat or week-day work lunch if you have a few spare! The first is a classic combination of sweet red onion, milky mozzarella, salty pancetta and earthy mushrooms (I mean come on – yum), and the second; intensely flash-cooked ripe tomatoes with fresh asparagus, salty feta and garlicky, herby pesto. 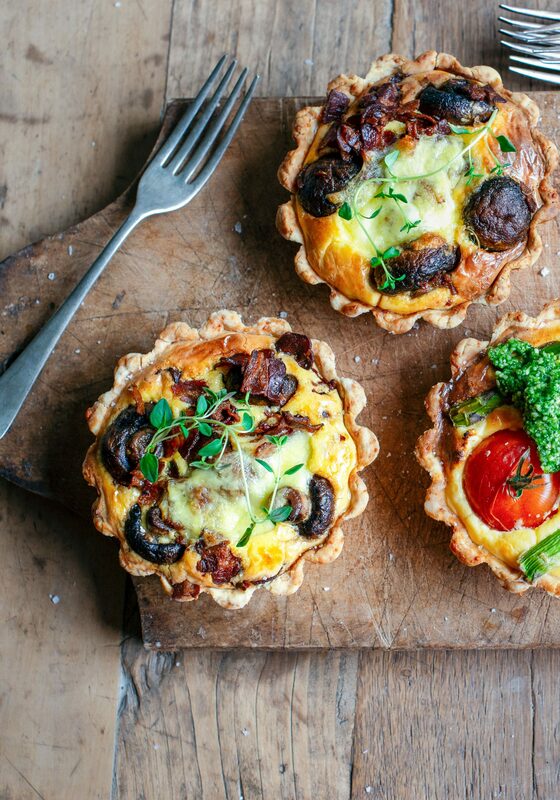 Both combos are baked with rich creamy eggs in a short, crumbly pastry – so basically just a perfect little arrangement of flavours and textures. The pastry seems like a faff to make and I know a lot of people get scared of it, but honestly just bung the ingredients in the food processor and your’e done. The only slightly tedious bit is getting it in the tins, but I promise, it is so worth it. And finally, yippeeee, on a total whim I am blatting down to Welly to see the men/boys on Wednesday, and I can’t wait! Gorgeous Hoob has finished all of his exams, so no more university for him – I am so bloody proud, and know that he will do amazing things. Meanwhile darling Pog is re-starting his educational journey by finishing off his design degree – but lets face it, as the lead designer of my book, his skills are outrageous (you should see the next one). So, a night out with my lovelies will be a fabulous treat, and the perfect antidote to the frenetic energy of the last few weeks. Right then, time for my walk, have a great week, and see you soon…. You will need 6 x 12cm removable base tart tins, 3cm deep. For the pastry, put the flour, butter, salt, and parmesan in a food processor and whizz until it forms breadcrumbs. Add the egg and whizz until it is starting to clump together. If necessary add 1-2 teaspoons cold milk and continue to whizz until it comes together as a pastry. Tip out and pat together, then chill in baking paper for 15 minutes. Roll the pastry out between two sheets of baking paper and use to line the base and sides of the tart tins.This doesn’t need to be particularly neat, as long as it is fairly even and fully covered. Chill while preparing the filling. Preheat the oven to 180˚. Heat the oil in a large heavy based pot or frying pan and cook the pancetta for three minutes. Add the mushrooms, season with salt and pepper, and cook over a medium high heat, stirring occasionally, for eight minutes, then remove from the heat. Put the cream cheese, parmesan, cream, eggs, yolk, and garlic in a food processor and whizz to form a smooth mixture. Cut six circles of baking paper larger than the tart tins and place inside the pastry, then fill with baking beans, weights or rice. Cook for 10 minutes, remove baking beans and paper, and cook a further eight minutes. Divide the caramelised onion between the pastry cases (still in the tins), and fill with the cream cheese mixture and mushrooms. 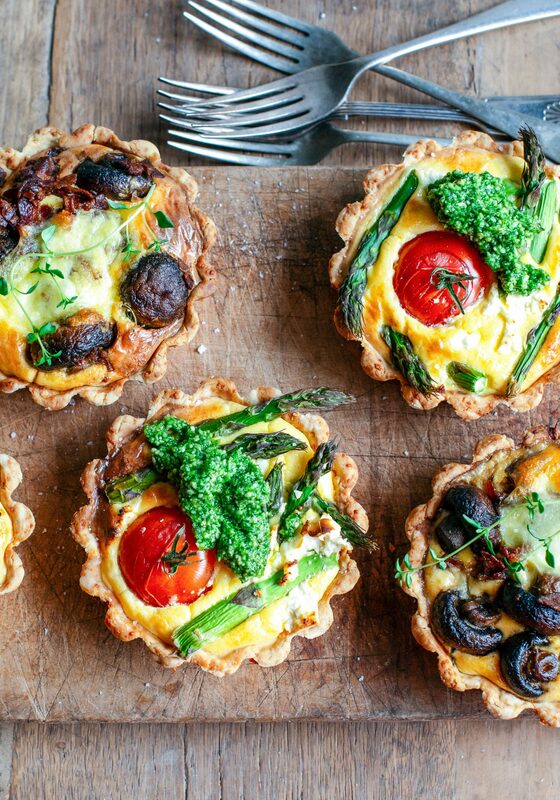 Tear the mozzarella into small chunks and place a piece on each tart. Bake for a further 25 minutes until cooked through. Leave to cool for 10 minutes before serving, or allow to cool and serve at room temperature. You will need 6 x 12cm removable base tart tins, 3cm deep. For the pastry, put the flour, butter, salt, and parmesan in a food processor and whizz until it forms breadcrumbs. Add the egg and whizz until it is starting to clump together. If necessary add 1-2 teaspoons cold milk and continue to whizz until it comes together as a pastry. Tip out and pat together, then chill in baking paper for 15 minutes. Roll the pastry out between two sheets of baking paper and use to line the base and sides of the tart tins.This doesn’t need to be particularly neat, as long as it is fairly even and fully covered. Chill while preparing the filling. Preheat the oven to 180C. Put the cream cheese, parmesan, cream, eggs, yolk, and garlic in a food processor and whizz to form a smooth mixture. Cut six circles of baking paper larger than the tart tins and place inside the pastry, then fill with baking beans, weights or rice. Cook for 10 minutes, remove baking beans and paper, and cook a further eight minutes. Divide half of the feta between the pastry cases (still in the tins), place a tomato into each, and fill with the cream cheese mixture and asparagus spears. Top with remaining crumbled feta and bake a further 25 minutes until cooked through. Leave to cool for 10 minutes before serving, or allow to cool and serve at room temperature with a dollop of basil pesto. Love your recipes! Book on wishlist for Santa. Enjoy Welly, you’ve bought calm to the Capital after a blustery day. We look down over Evan’s Bay, airport & Cook Strait.